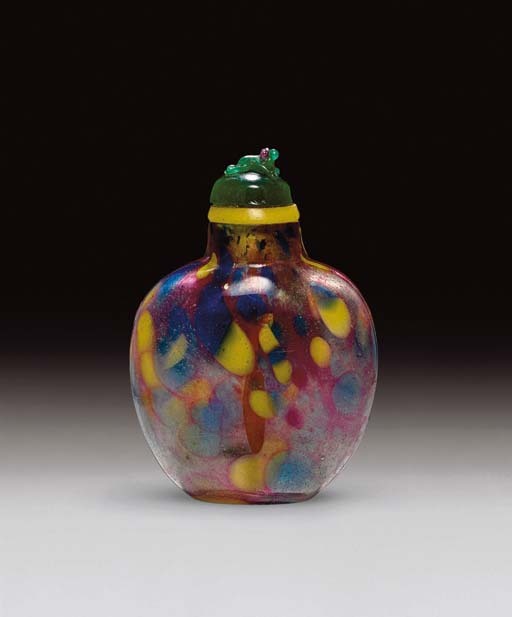 Sandwiching different colors of ground glass between two layers of clear glass was a technique used in snuff bottle production from early in the snuff bottle period to late in the Qing dynasty, and large numbers of these bottles were produced at the Imperial glassworks for distribution on a grand scale as gifts. Apart from the distinctive sandwiched technique of containing the main decorative scheme between two layers of glass, they were apparently all blown into two-part molds and are often of this simple form. The profusion of these sandwiched glass bottles and their inclusion in most early collections would seem to suggest that they were readily available from the mid-nineteenth century onwards.